One thing that has been really annoying me lately is the sheer amount of ads on websites that use flash animations. Seriously, it makes websites look like they’re from the 90’s with the amount of animating crap on them. 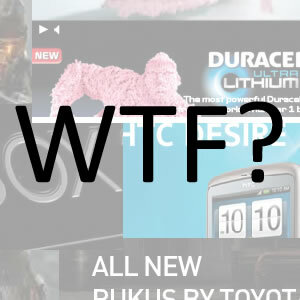 Several sites that I visit often have decided to place 4 (some sites more) ad spots on every single page. Every single one of those ad spots is filled with a flash animation that not only cheapens the look of the site, it also slows down everyone’s browser. Don’t get me wrong, I’m all for placing ads on websites. I know that it’s how people make their money. But there’s a point where it just gets pathetic. There’s one ad in particular that really got me to think about this. The ad for the new XBox 360 Slim. It spins around and uses so much of the computer’s resources that I can’t even scroll until this stupid animation is finished. Microsoft has a lot of explaining to do with this one. Normally I hate using AdBlock Plus, the extension for several browsers that maintains a list of ads to block, but now I’m really considering turning it on. Just so that I’m not barraged by ads that do nothing to entice my interest in the product except slow down my browser and annoy me with animations.